This tutorial assumes you have basic knowledge of Hammer, either from Half-Life 1, or Source engine level design experience. You are expected to know how to place and create brush based entities, and know how to make at least a simple room. By the end of the tutorial, you should be able to understand the different kinds of glass available, and how to make them. There is an example map available (below), however this tutorial will assume you are building it all from scratch. This type of glass is fairly simple to make, but there are a few things you need to know to get the best out of the effect. Firstly, make a room, lights and start point etc. Then you need to make a brush for your glass, any size will do. Any material that has been defined as glass can be used for this, but in the example map I used "glass/glasswindowbreak070a". Now, the very important thing to remember is that only 1 surface on the glass brush should contain the glass material. All the other sides should have the nodraw texture on it. When it's rendered in game the glass texture will appear on both sides and the glass will have no thickness. There is one more step: turning the brush into an entity! 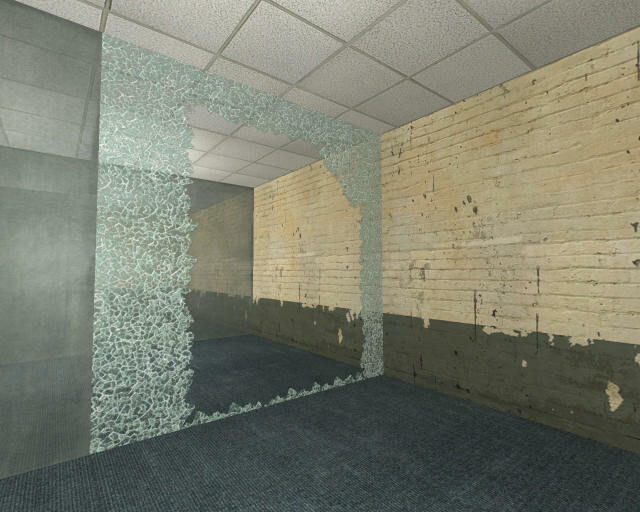 For this kind of glass we use the func_breakable_surf entity. Go ahead and tie the glass brush to that entity now, then open its properties. "Prop Data" should be set to "Glass.Small". The help file says that the "Health" field controls how much damage the glass takes before breaking, but it doesn't seem to have an effect. I think this is controlled in the material file, so for now just leave it set to 5. "Material type" should be set to "Glass", as should "Surface Type". "Fragility" controls how fragile the glass fragments are after being broken. For instance if this is set to a very high number (like 300) all the glass will shatter the moment it's broken. If you set the number very low (to 5 for instance) it will take a lot of built hits to completely destroy the glass. A number between 100 and 200 emulates real glass pretty well. 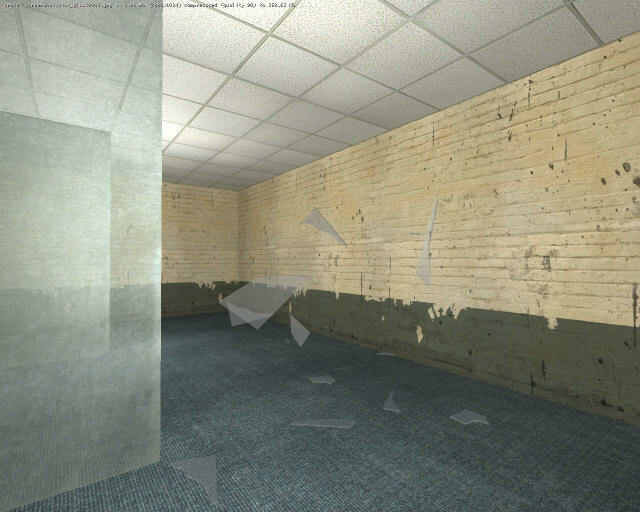 Note that unlike glass in Half-Life 1, you don't need to change its "Render mode" or similar options as its transparency is defined in the textures alpha channel. This is the glass you know so well from Half-Life. It's built the same way you built the glass for the previous type, remembering to texture every side but one with the nodraw texture. However instead of func_breakable_surf, we tie it to a normal func_breakable entity. Again I will only explain the relevant attributes. "Prop Data" as before, should be set to "Glass.Small". Like the "Health" field above, "Strength" does not seem to have an effect, so leave it set to 10. "Material type" should be set to "Glass". And that's it. The moment the glass is shot it will shatter and disappear completely (unlike the new style glass that leaves a broken rim of glass). This is the easiest of the three to make. It starts the same way as the others, glass brush with the nodraw texture all on sides but one. Then all you have to do is tie it to the func_detail entity, and you're done! No settings to configure. That's it for this tutorial. It's all pretty straight forward but if you have any questions (or spot any omissions/mistakes) please post them in the comments below. pretty good tutorial, i was actually wondering howto do this when i was checking out hammar earlier. i just cannott get this to work. In what way "not work" ? ok how can i make this so that you cannot shoot through the glass? I havn't tested it, but I assume if you create a second brush covered entirely in the tools/clipbullits material, and place it behind the glass brush, it should work as you wish. will that work for both sides of the glass? The side where the brush is, probably wont have any bullit decals, but it should work (Again this is all in theory, the best way is to experiment). ill try that clipbullets idea and tell if it worked tonight...i sure hope it does. Every time i make a window in my level it errors out as soon as it comes into view. Yet I made a level with 8 levels of big glass plans. Why would that work but putting two plans in my other level not work??? 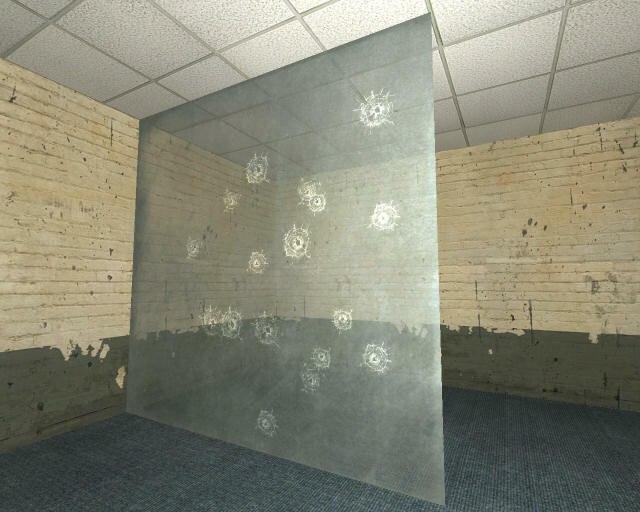 So how do I edit how many bullets or how mutch damege the glass material can take befor it breacks. See I am tying this to a brick brush and I want to make it so it dosn't breack in like 2 shots.